In this tutorial, you will learn how to reset passwords for multiple user accounts at once, and how to use value references like %username% and %adm-RandomString% to create a unique password for each user. Select the users whose passwords you want to reset, right-click the selection, point to All Tasks and click Reset Password in the context menu. If the user accounts are spread across different Organizational Units or domains, you can add them to the Basket first. 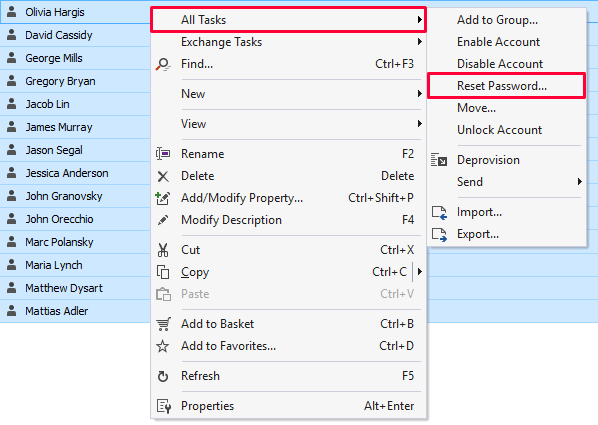 To add an object to the Basket, right-click it and select Add to Basket in the context menu. Select the Generate password using template option. To generate a unique password for each user you need to use value references (e.g. %username%, %department%). Value references will be replaced with corresponding property values of each user account. The value references contained in the template will be replaced with the values of the User Logon Name and Employee ID properties, and the generated password will look like johndoe-123321. To generate random passwords, you can use value reference %adm-RandomString%. For example, the following template: %adm-RandomString,12% can be used to generate a random password of the length of 12 characters. To insert a value reference, click the button.